EmPOWER Maryland, the energy efficiency program passed in 2008, is saving Maryland ratepayers $140 million on electricity costs every year, according to a new report by Maryland PIRG. The report, “Stepping Up to Bigger Savings: How Maryland Utilities Can Save More Energy by Adopting the Nation’s Most Ambitious Energy Efficiency Programs,” also found that many cost-saving measures have still not been adopted by utilities and the state, and this stalled progress is costing consumers. 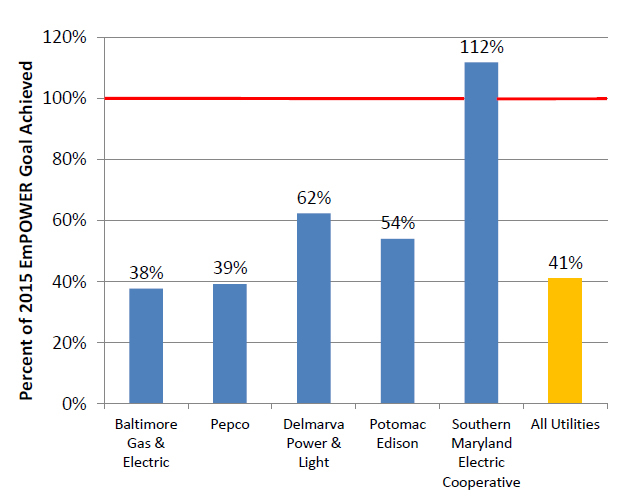 EmPOWER Maryland’s energy efficiency incentives have saved ratepayers millions by reducing energy use and avoiding the need for costly transmission and generation projects. The General Assembly passed the EmPOWER Maryland Energy Efficiency Act in 2008, setting a statewide goal of reducing per capita electricity consumption 15% by 2015. Two-thirds of those savings must come from utility companies, which are regulated by the Public Service Commission. The utilities are falling behind on this goal- if they continue with their current plans they will only achieve 73% of their goals for electricity savings. Although utilities and the Public Service Commission need to do more, businesses and consumers have already seen major benefits from programs currently in place. "Maryland policymakers recognized that energy efficiency to meet its energy needs and confront its environmental challenges at the least cost with the EmPOWER Act," says Josh Craft, the Manager of Policy Analysis for Northeast Energy Efficiency Partnerships. "By implementing the recommendations within this report, Maryland policymakers can build on the great work they are undertaking now to strengthen their energy efficiency programs and continue their regional leadership in energy efficiency." The report makes recommendations to maximize the positive effects of energy efficiency, suggesting that the state should; work with PSC to hold utilities accountable for meeting their timelines and approve better and broader programs; restore funding for energy efficiency projects and coordinate programs statewide; and establish energy savings goals beyond 2015. Maryland PIRG Foundation works to protect consumers and promote good government. We investigate problems, craft solutions, educate the public, and offer meaningful opportunities for civic participation.